You knew Maradona would appear on this list, didn’t you? As much as I didn’t want to include him here (his egomania could definitely hurt my All-Time Best XI squad’s team chemistry), I simply couldn’t deny him this honor. When at his peak, as at the 1986 World Cup in Mexico City, he was probably the best player in the history of the game. Maradona appeared in four World Cups, though his final one would end in disgrace when he was sent home for failing a drug test. It wasn’t his only inglorious World Cup moment, as he was actually sent off in a game against Brazil at his first Cup. 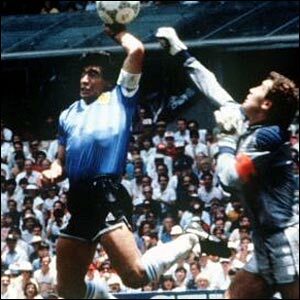 But, this list is all about players’ legendary feats, so let’s move on to Maradona’s memorable moments. Maradona led Argentina to the 1986 and 1990 World Cup Finals, and his unparalleled performance during the ’86 Cup, which Argentina won, is now part of world soccer lore. He would be deservedly awarded the Golden Ball for his play, and his second goal in the quarterfinal against England is remembered as one of the World Cup’s best. Maradona’s life has been mired in controversy and his many scandalous exploits have led many to chastise him for being a selfish person. But, during the 1986 and 1990 World Cups, he showed that he was an unselfish player and his remarkable performances would lead Argentina to its 2nd title. He was one of the best, so he belongs on this list.